No matter how the US responds, this video is a major propaganda coup for those resisting imperialism. It has the potential to have an effect similar to Abu Ghraib in Iraq. The video has more sensational potential than the video of US troops executing a wounded combatant in Iraq. Even though the bodies appear to be corpses, all of the US crimes in the region can be symbolized in this simple, disrespectful act. 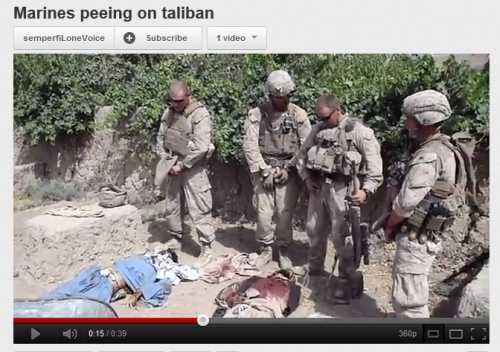 Even though the dead do not feel, every living Muslim, even living Afghanistani, will see this as US marines urinating on their loved ones. The USA is the enemy of humanity. A line in the Sandinista anthem used to be ‘The yankee is the enemy of the human race.’ The Sandinistas were beloved of western liberals and ‘leftists’ once upon a time. I’ve always maintained that if the Sandinistas could sing this song so could we but I must admit I have never had many takers for this line. workers of the world unite to resist and defeat US imperialism!